The Commonwealth of Learning (COL), the Commonwealth Centre for Connected Learning (CCCL) as well as CCCL’s host state, Malta, were represented at The 2nd World Open Educational Resources Congress which took place in Ljubljana, Slovenia on 18-20 September. The agenda of this second congress, co-organised by UNESCO and the Government of Slovenia under the title ‘OER for Inclusive and Equitable Quality Education: From Commitment to Actions’, focused on practical approaches to and a common understanding of OER policies in participating states. CCCL’s International Advisory Board met on the fringes of the OER Congress to discuss the Centre’s imminent strategic plan, with particular focus with working in parallel with the Ljubljana congress outcomes. This congress was tasked with making a critical shift from commitment to action. It assessed progress made in OER policies and practice since the Paris Declaration issued after the 1st OER Congress at Unesco Headquarters in 2012, which called on called on governments worldwide to openly license publicly-funded educational materials for public use. The Slovenia congress sees a meeting of minds involved in the the regional consultation process and a drawing together of conclusions from the various OER regional summits in recent months to take stock of the state of play since Paris. Professor Asha Kanwar, President and Chief Executive Officer of the COL and one of the world’s leading advocates of learning for development, had said in Malta that of the 10 Paris recommendations, three in particular were pertinent in assessing the current OER climate in 2017. These are the extent to which governments and institutions have fostered awareness of OER; its promotion in different languages and cultural contexts; and the issuing of open licences for content developed with public funds. It has been observed that awareness of OER has spread faster than its implementation. However there remain obstacles that hinder the mainstreaming of OER by the global educational community. While advances have been made in each area noted in the Paris Declaration, increased efforts by the international community are still necessary. The response to the regional stakeholder survey has been good, but it has also highlights some persistent barriers to realising OER. Thee remain many contradictions in policies, definitions and actions among the participating states. There were major discrepancies among countries and regions in the interpretation of OER and what constituted an OER policy. Some respondents indicated that their states had defined national-level OER policies while others were interpreting OER on a project-by-project basis with no overriding higher level policy in place. Survey respondents had clearly identified the key benefits of OER as a way to provide more flexible learning opportunities, enhanced access, better learning outcomes and an overall reduction in educational costs. However, perennial yet not insurmountable barriers to achieving widespread action on OER existed. These include: insufficient quality content; a lack of capacity; and a lack appropriate policies. There remains also concern that there were too few credible OER business models to convince policy makers and governments of OER capabilities. The outcomes of the six OER Regional Consultations that took place from December 2016 to May 2017. Inputs from the debates and discussions at the 2nd World OER Congress (18 to 20 September 2017, Ljubljana, Slovenia). 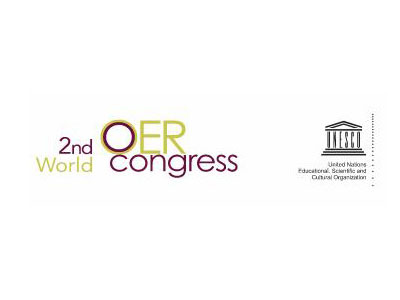 More information can be found on the 2nd OER Congress website. We will link to the final action plan and speeches when available online.